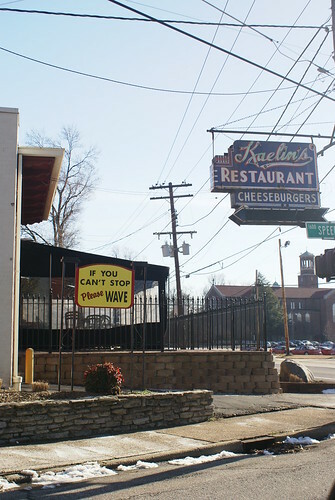 Kaelin’s Restaurant, the Birthplace of the Cheeseburger, Closes… for Remodeling? According to a thread on the Louisville HotBytes forum, Kaelin’s Restaurant — allegedly the birth place of the cheeseburger, opened in 1934 — closed for good last night. We haven’t seen confirmation from any local media just yet, and their web site is still active, but the HotBytes forum is usually a good authority on such matters. Needless to say, the closing of a great Louisville institution is something we’re not thrilled about. When we find out more details online, we’ll update this post. UPDATE, 10:45 PM: It appears we may have been misinformed as to the permanence of Kaelin’s closing. Michelle at Consuming Louisville informs us that Kaelin’s is closing for renovations. We can only assume for now that means an updated Kaelin’s.